Situated on the leeward side of two dormant, butte-like volcanoes, you�ll find one of Cowboy Shootings best kept secrets. It�s a place where natural stage design turns western fantasy into reality. 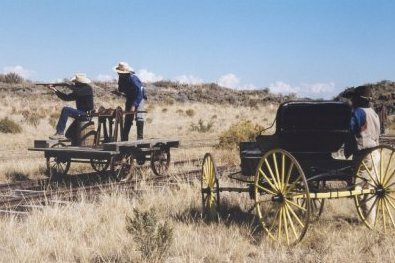 Where the fragrance of sagebrush, the jagged rock formations and the distant yips of young coyotes carry your mind away to a time when only a buckboard or an occasional stage coach rambled through these parts. 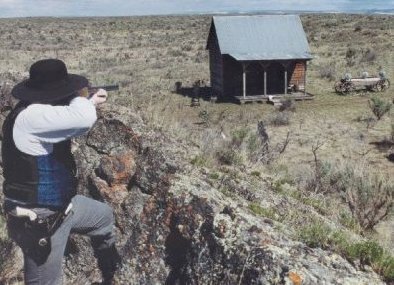 Now, a century and a half later, the Old West lives on at the Cowboy shooting range of the Twin Butte Bunch. 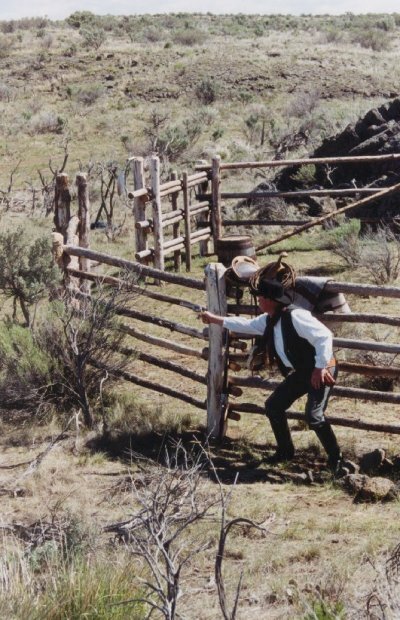 Although not an option for everyone, Natural stage design adds a dramatic Old West dimension to the usual Cowboy Shooting experience. It requires a scenic location, a commitment to western detail, a fair budget and a lot of work. Finding that perfect location can be elusive, but like hunting for wild animals  they are where you find them. Or so it was for our new Club located in the lava desert country in Southeastern Idaho. It all began a few years back, after my first shoot, when a wishful idea began to take shape. 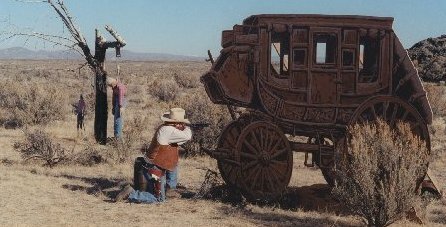 “Why enact a western fantasy in your mind if you can make it become a reality?” Looking back, it�s interesting how the fantasies and reality all fell into place. Once in a while, just when a gamblers luck is looking mighty poor, he�ll turn up a handful of winning cards. That�s how it was when I stumbled onto what is now our range. I had about given up on finding a nearby location for an all natural Cowboy Shooting range. As a last resort, I went to visit the local Unified Sportsman�s Shooting Club (USSC). I thought that maybe their 1000 yard, high power rifle range, would somehow be usable for Cowboy Shooting. Well, just as I�d figuredit wasn�t. However, they told me that a portion of their public range was, in their words, �rocky waste land� and not much good for anything, but that I could look it over if I wanted. What I found, hidden in small valleys and rocky hills was like finding a wild card and four aces! Yep, there it was  the perfect, Old West backdrop, wild and untouched. My imagination seemed to flicker, as I explored, with scenes from TV westerns I�d watched as a kid. Soon, fantasies started to take shape with the clearing of brush for roads which would link three shooting fields, with five to six stages each. Additional space was set aside for a western town site, overnight camping and parking areas. Ideas for possible stage designs came easily as mother nature had already prepared each stage with unique natural features which inspired specific western themes. The gold mine with ore car and track, along with the outlaw hide-out and corral were the first stages to be finished. I then borrowed some timers from the Idaho Falls Club and we started shootingsometimes only one or two showed up, but it was a start. Next, the full size railroad, with hand pump car, and the Bank/headquarters building were finished. 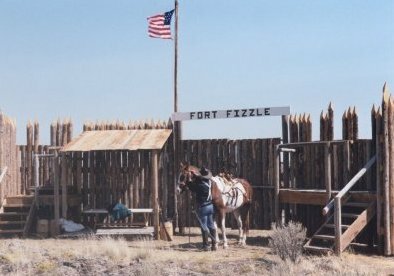 Fort Fizzle, with a small herd of full size buffalo and elk targets, was then added. New features continue to enhance our realistic approach to the sport. Along the way much has been learned about how to maximize the fun without minimizing safety. Below are some basic things to consider when working with natural stages. Safety factors  Natural stages require a higher level of safety awareness both in stage design and during the actual shooting competition. Safety walk-throughs and pre-shoot safety evaluations are mandatory. Each stage will have different safety issues so use your head, if it looks questionable don�t do it. This is not intended to be a complete list of safety issues but will give you an idea of things to be aware of. Locate shooting lanes between natural barriers or in small valleys when possible. Space out stages. Allow plenty of room on each side especially if there are no natural barriers. 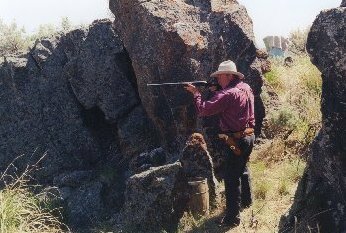 Even when using natural barriers, do not locate shooting positions down range of other stages. During a match, use every other stage when possible. Anticipate where shots will impact or be deflected, especially in rocky, wooded or standing water areas. Use targets that do not require down range resetting. Limit shooter movement to lateral directions. Look out for objects that may cause a shooter or match personnel to be entangled or fall, or to be brush whipped. Fire all live rounds and stage or holster a firearm before shooter movement. Natural stages can be physically taxing. Don�t push shooters to accident prone exhaustion levels. Post warning signs along range boundaries to alert hikers, cross country runners, horse riders etc. Variety and flexibility  These two items cannot be overstressed. Do everything you can to make things different and new. Here are a few ideas. Design flexibility into props and structures. With safety in mind, employ several ways to: walk through, duck under, step up on, sneak around, hide behind, grab hold of, look over, ride on, lay in, open up, drag, carry etc. Rotate to a new set of stages for each new match. With natural stages you can relocate the firing line once in a while to add variety. Use a large variety of target shapesvisit the library for all kinds of animal shapes and other ideas. Vary the complexity of stages from simple and fast to some with a fair amount of movement, and a few challenging long range stages. Use a lot of real western props. In addition, props from any time period can be used in a “back to the future” theme (There are some very interesting possibilities here and quite easy to put together). Throw in a “just for fun” stage with a recorded sound track and let folks ham it up a little, without the timer and present a special “silver screen” award. Give each shoot a theme such as: South of the border, Spring roundup, Buffalo and wild critters hunt, From the silver screen, Rustlers and horse thieves, Louis L�Amour tales, Gamblers and desperados, Back to the future, etc. This also provides a chance for folks to dress for the theme if they wish. Set up an attractive natural stage with western props just for visitors and shooters to take photographs before or after a shoot. leave some stage areas undeveloped and designated for temporary props or “open” themes such as bad lands or cattle trail scenarios. Buildings in the process of constriction can be worked into a scenario. Some very nice props can be obtained from local college drama departments after a play is over, often at no charge. Visit the horse barn at your county fair for tips on folks who may provide wagon or stagecoach props. Sales people at livestock auctions can give you tips on where to find longhorn cattle. Be sure you have strong corrals  Longhorns will crawl through about anything. Some shotgun ranges have mobile units you can bring in for throwing clay birds and rabbits which make for an interesting and challenging stage design. Moving targets are exciting and are not always difficult to hit. 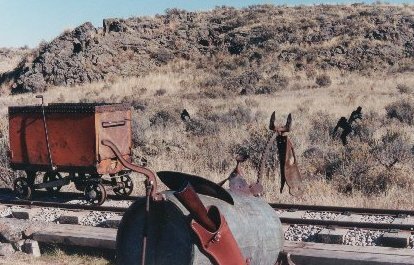 “Brutus”, the charging buffalo, actually runs, in life-like action, past the shooter on the railroad track. Long gongs shot with a single shot “buffalo gun” can be added as a bonus score. Place targets behind a building or multi-wall prop so that the shooter must shoot through two windows, or other openings, that line up at a certain shooting position. The natural stage concept has been quite a calling card for the Twin Butte Bunch. A very high percentage of shooters attending monthly matches are out-of-town and out-of-state folks. What you won�t find are the hassles of huge crowds or long waits, just friendly folks turning fantasies into reality. 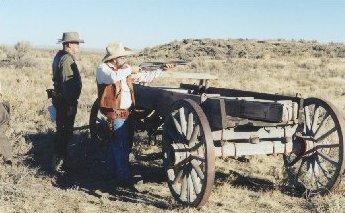 The Twin Butte Bunch shoots on the third Saturday April through November, except for June which is the Annual two day Idaho Territory Matches held on Fri. & Sat., June 28 & 29. The range is seven miles west of Rexburg, Idaho on State highway 33. This article appeared in the Sept/Oct. 2003 issue of Shoot Magazine. Reprinted with permission. Here's a copy of the original article (977 KB PDF). Note: This article was published in 2003. Please be sure to check this site for the date of this year's two-day match.